Hello everyone! 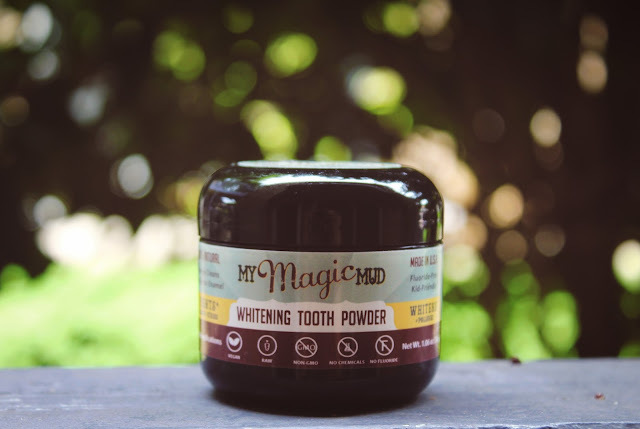 I wanted to do a very exciting review for you all on My Magic Mud whitening tooth powder. I actually came across this product while discussing natural remedies to whiten teeth with my uber driver. He suggested this as a natural & affordable method, so I absolutely had to give it a try because I'm all about natural & affordable stuff. Upon receiving the product, it seems quite small for being around $20, but I assure you, it lasts a very long time. I've had mine for over a month & hardly made a dent in it. It says it usually lasts around 3 months, but I believe it can go a longer way. You simply dip your toothbrush in the little container & use it like regular toothpaste. It seems a little weird scrubbing with powder instead of paste, but I quickly got accustomed to this. The directions recommend scrubbing for 2 minutes, which actually doesn't feel that long. You use it at night to replace toothpaste, but continue using regular toothpaste in the mornings. 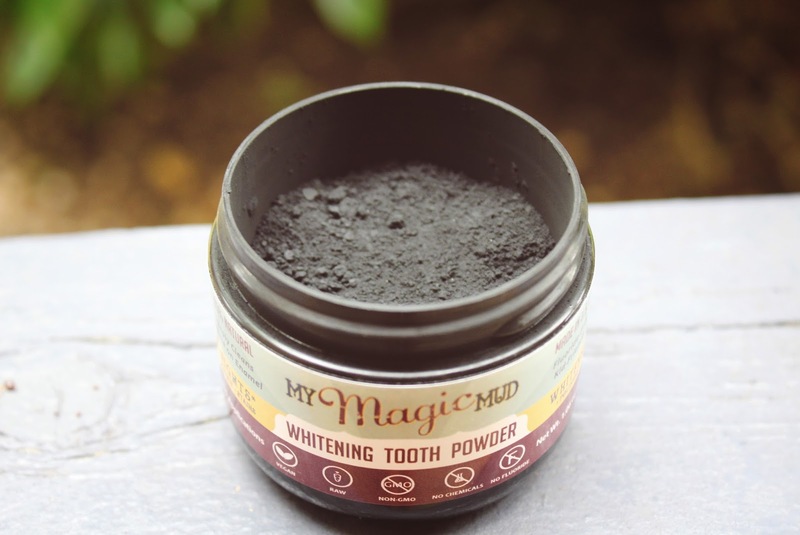 Magic Mud contains 4 ingredients that work wonders for overall oral hygiene: activated coconut shell charcoal, calcium bentonite clay, orange peel extract powder & mint extract powder. One major problem I had with previous teeth whitening methods is they made my teeth extra sensitive. 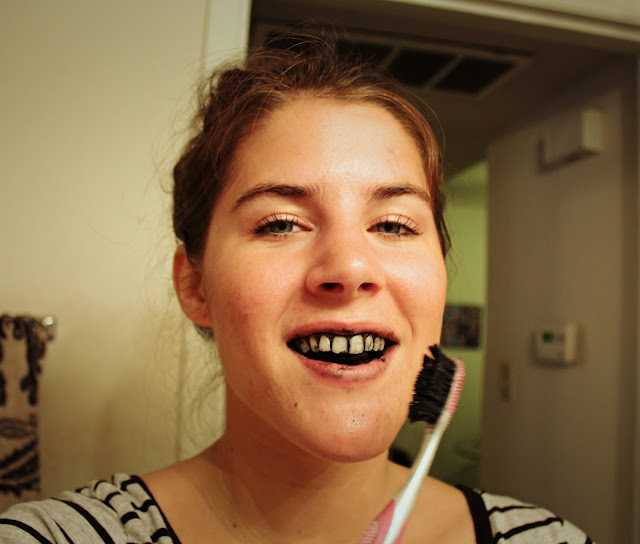 Magic mud not only made my teeth noticeably more white, but also decreased the sensitivity of my teeth. The charcoal combats harsh stains that can be brought on by environmental factors (coffee, tea, wine etc.) The clay helps remove toxins that cause plaque buildup. The orange peel extract helps get rid of stains & the mint extract gives the mouth a deep cleaning, preventing bad breath. It has a very subtle taste that I actually prefer over regular toothpaste. It's completely safe to swallow, which is why kids can use it as well. Magic mud is both vegan & non-gmo. There are zero chemicals, making it stand out from conventional toothpaste. If you have a problem with fluoride then I highly recommend this since it's fluoride-free. My uber driver warned that it could get a little messy, which was an understatement. After each use, I have to wipe down my entire sink to get rid of the black stains. They easily come off & can be washed out of clothing if need be. Here's a video demonstrating how to minimize the mess left behind. As you can see above, it's not the most glamorous way to brush your teeth, but then again, who cares? Since becoming a college student I've noticed how much I struggle maintaining my oral hygiene. There's just too much going on that I forget how important it is to take care of my teeth like an actual adult is supposed to. Overall I'm so glad I made the switch from regular toothpaste to magic mud. It has definitely made my teeth feel & look a lot healthier within the past month of use. I highly recommend it if you're looking for a way to whiten your teeth without chemicals. I hope you get a chance to try it out! If you'd like to purchase My Magic Mud, you can find it here on Amazon.